The trial period for Cognitive SEO Tool is two weeks, not a long time for those working on numerous projects. Like any other typical trial, it does have its limitations, like only being able to see the first 200 suspect or unnatural links and only having the capability to export 200 links. Nonetheless, it looks like the major functionalities can be tested. However, users should keep in mind that when using this trial, they will be required to provide their credit card details upfront. This means one should remember to cancel before their trial ends, or be forced to have to pay. 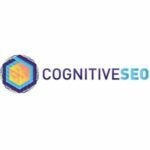 Compared to other sites in the industry, Cognitive SEO is among the tools that offers the broadest data samples. Google search console obviously leads the pack, but Cognitive SEO is among the best, beating other tools like Bing and the Open Site Explorer.one major advantage of this tool is the ability of users to import links from all the competitor tools mentioned, and merge them into their lists. They boast good data providers, tools like Majestic SEO, Ahrefs, SEOclicks and Blekko. One of the reasons why it is loved is its interface. Although it might take one a bit of time to understand and work around, once one gets round to it they will find it very useful. 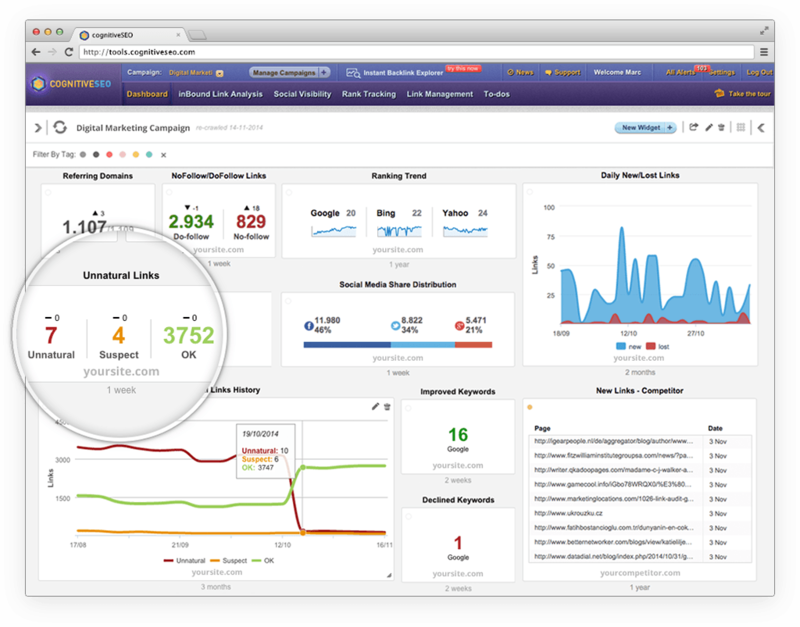 Of particular concern is the inbound link analysis tool, which is by far the largest feature set in the tool. Although it might seem like they have some resemblance with such tools like Majestic SEO in terms of citation flow graphs and so on, they go even deeper with their analysis. The main aim of the tool is to help users analyze their backlink profiles. Cognitive SEO gathers data about every link, information on their link location, anchor text, page and domain authority. With this, one can infer further information regarding the forum, directory or the blog. All this information is collected together and used to determine whether the link is suspect or unnatural. Backlink analysis is a process that demands a scheduled and systematic approach and this is exactly what this tool offers. It is able to analyze the unnatural backlinks and report on the same to give a user the chance to get rid of the same and avoid any penalties from the search engines. This gives the ecommerce campaign a genuine and quality background which ensures traffic is effectively directed and that rankings are increased due to quality backlinks. This is one of the few tools that are able to provide effective and relevant backlink data which can be used to optimize the marketing campaign and ensure that every aspect of the SEO process is quality oriented. The backlink data allows a user to identify the number of backlinks and compare the same against the traffic being generated to identify the effectiveness of the links. Cognitive SEO is designed with a well-articulated user interface which gives a user the freedom to effectively understand the process of backlink analysis and how the data will prove useful to the marketing campaign. The user interface gives ease of use which cements the aspect of effective management of the campaign. The tool is very effective when it comes to the SEO management and ecommerce campaign structuring since it has all the SEO tools needed for the processes. The full set ensures that a user is not limited in terms of adopting strategies that will increase the visibility of their site and also build the desired traffic effectively. This is a very important aspect in internet marketing since it is what ensures traffic is generated and rankings on search engines maximized upon. With the tool, a user can be able to build appropriate and profitable links that will drive traffic and attract clients. Building links also ensures that the appropriate backlinks are sourced which will drive traffic in return. With Cognitive SEO a user gets to have the capacity to track and note up to 500 keywords which is admirable for the tool. The tracking process ensures that profitable keywords are identified and structured into the keyword lists that one needs to have. This tool is quite notable when it comes to tracking the competition. This is because there is a feature that allows a user to register their own URL while also input up to 5 URL of the direct competitors after which the monitoring process can begin. With this aspect covered, users can rest assured that they will be able to effectively monitor the competition and identify the strategies they are using to perfect the SEO campaign. This gives a user the chance to effectively optimize their campaign to conform to the trend that the competitors are setting. The downside with using this tool is the fact that its keyword research feature is not as strong as that of other tools in the niche operating space. This means that aspects like the targeting of keyword suggestions and keyword difficulty ranking cannot be accessed by a user which makes for a significant disadvantage which limits operation efficiency.